32 years after the infamous massacre, the Shatila camp for Palestinian refugees still stands, albeit more impoverished and overcrowded than before, and more isolated from the modern, glitzy Beirut that lies beyond its checkpoints. Omar Ghannoum is a member of the Ma’an (Together) Youth Group, made up of 17 young people from the Shatila and Burj El-Barajneh refugee camps in south Beirut, Lebanon. They stand in for their community where society has repeatedly and consistently failed them. Omar speaks to Eamonn Sheehy on life today at the Shatila camp, which has recently received an influx of refugees from Syria. 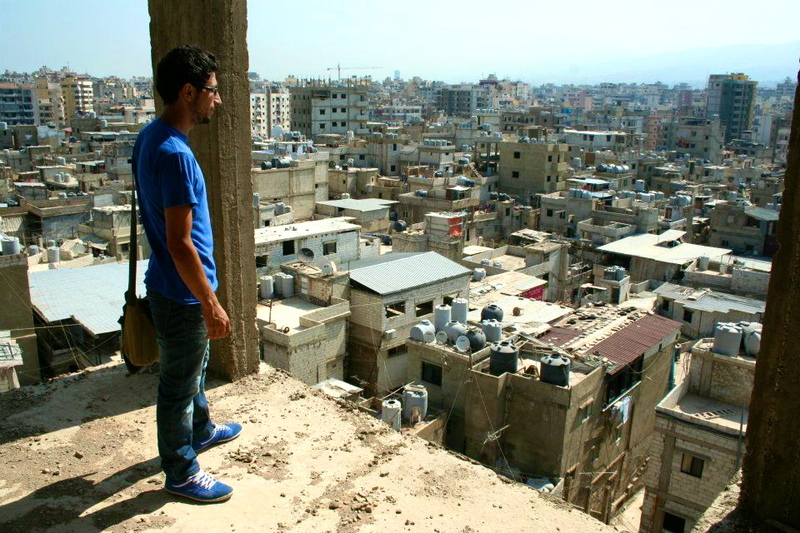 Omar Ghannoum of the Ma’an Youth Group looks out over the Burj El-Barajneh camp, south Beirut, where he lives. Omar. I attend Beirut Arab University, where most of the Palestinian students study. Some of the Lebanese have no idea about the Palestinian refugees in Lebanon! The camp is in a poor neighbourhood while Beirut, the capital, also has its tall towers and rich neighbourhoods. So we do feel the class struggle. Eamonn. Do you think there is a climate of fear in Beirut today, between different factions and people? O. Sure, especially since the revolution in Syria and the deteriorating situation there. Now the Lebanese parties are divided, some of them support Al-Assad while others support the revolutionaries. It has created a special kind of fear here. E. Do you think Lebanese youth are inclusive of the Palestinian youth? Or are they distant? Are the Palestinian refugee camps very isolated from other communities in Beirut? O. I can say that the Lebanese youth in general are still distant from the Palestinian youth in Lebanon. Because of the Lebanese army check points in front of the Palestinian camps and the legal discrimination against us, we are forced into isolation here. E. What do you think of Mahmoud Abbas’ attempts to obtain UN statehood for Palestine? Where do you see the future of Palestine going? Have you ever been to your homeland? The twelve refugee camps in Lebanon administered by the United Nations Relief and Works Agency. Shatila and Burj el-Barajneh are located in south Beirut. O. I understand Abbas and the PLO’s attempts, but it doesn’t satisfy our demands. The Palestinian statehood is going to be on the 1967 borders (the Gaza strip, West Bank and East Jerusalem), while we are from North Palestine! Which today is Israel! Palestinian statehood makes no sense to us here. Our demand is to apply ‘194’, the right of return and compensation. Our struggle is not with the Jewish people; our struggle is with the Zionists. The Jewish people represent a part of the Palestinian nation as much as Christians and Muslims. Violence from either side will never lead to a solution, especially not from the Israeli regime. I have never been in my homeland of North Palestine, and my dream in this life is to go to Acre (Akka). E. Have you seen Palestinian refugees from Syria arriving in Beirut recently? O. In late 2012 we had over 100 Syrian-Palestinian refugee families here in Shatila, and over 140 in Burj El-Barajneh; today we have many, many more. Their situation is much harder than that of the Syrian refugees, nobody cares for them. Our youth group donated clothes to families, and we are trying to find any way we can to help them. E. Tell me what life is like for Palestinians today in West Beirut? O. We see first-hand how the Palestinian refugee community here in Lebanon are deprived of basic needs. Palestinian refugees in Lebanon are banned from most professions, from owning property to accessing public services. They do not have equal rights. The majority of Palestinian refugees live under the UN-defined poverty line, and almost 60% of Palestinian refugee children drop out of school around the age of 15. Our challenge is to overcome these obstacles by doing everything we can to help and empower our deprived community. 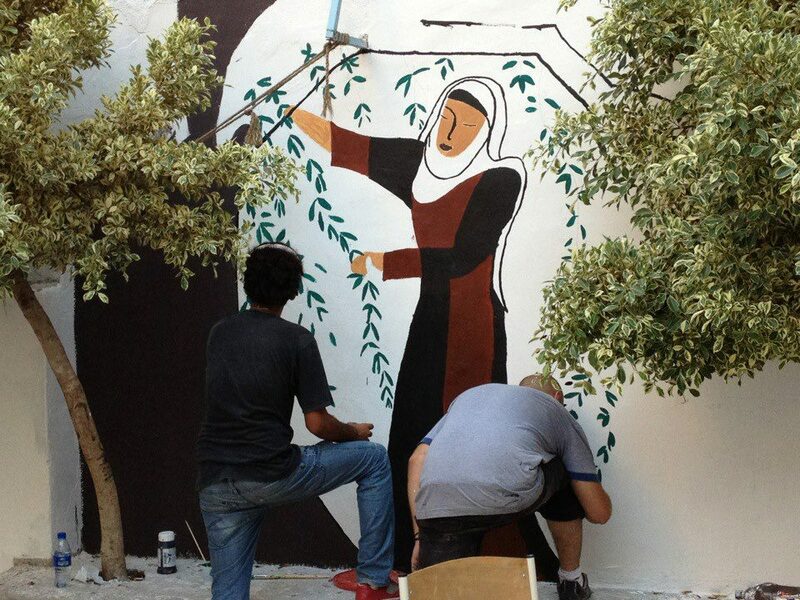 This mural at the UNRWA Ras Al Ain school in Sabra, Beirut, depicts a Palestinian woman in traditional dress picking olives. UNRWA schools stopped teaching Palestinian history after the Lebanese government prevented such classes. The Ma’an Youth Group created the mural as a way of representing Palestinian history on the walls of their camp and school. The Syrian conflict is affecting Lebanese society and of course the security in Lebanon also. Currently Salafist groups are growing, and what is happening in the north of Lebanon and in Sidon is proof of this. In the north of Lebanon there are daily clashes between Salafists and Alawis, and in Sidon a Salafist group attacked a Lebanese army checkpoint, killing 21 soldiers. E. With Syria in turmoil next door, how is Beirut handling life today? O. Beirut is divided into three main communities: the Christian community in north and east Beirut, a Muslim Shi’ite community in south Beirut, and a Muslim Sunni community in west Beirut. It is unsafe to travel from community to community, especially in south Beirut after Hezbollah’s intervention in the Syrian conflict. Salafist groups consider Hezbollah their enemy today and they are trying to hit south Beirut with car bombs. 25 civilians were murdered in the last explosion. E. Has the influx of Syrian refugees to Beirut made life more difficult in the city? O. Economically, prices have risen due to increase in demand, and wages have decreased due to the excess in the supply of labour. The unemployment rate continues to climb. Socially, especially for the Syrian refugees, some are homeless and most are facing difficulties in receiving education and medication. In general, Lebanon is overcrowded with refugees. E. Has the UNHCR helped Syrian refugees a lot? Does Ma’an Youth Group feel things are getting more out of control? Is it slowly becoming easier to help these refugees and your own communities? O. The UNHCR helps Syrian refugees but does not meet the full needs. Ma’an today focuses on education. We opened a centre in Burj El Barajneh camp in Beirut that offers educational services for Syrian children. Ma’an and the Palestinian Youth Movement (PYM) organised a concert at the American University of Beirut, and we raised funds that helped us to open the Al Nakab community centre. The funds we raised will keep the centre sustainable for six months. Things may spin out of control, but we have to stand with our people. E. What are your main concerns at this moment in time? O. I want to highlight the racism against Syrian refugees and Palestinian refugees in Lebanon. It is still very common. Racism has led to people taking advantage of cheap labour. We also see it in the stopping of people at checkpoints for longer periods, simply because they are Palestinians or Syrians. It’s an action by the Lebanese government to show us and Syrians that we are not accepted in this country. 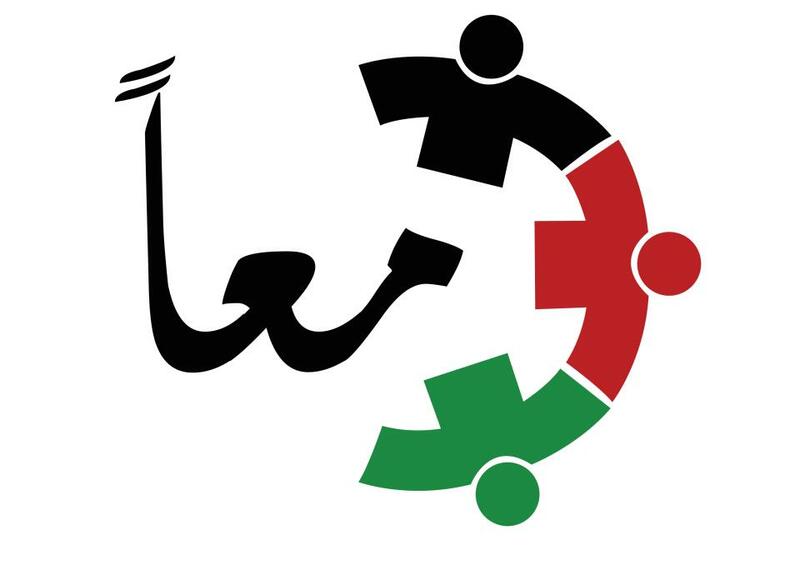 Ma’an Youth Group is a volunteer organisation made up of Palestinian refugee youths from the Shatila and Burj el-Barajneh refugee camps in Beirut, Lebanon. Ma’an works to empower and advance the lives of Palestinian refugees through community service, cultural events and advocacy. So far, Ma’an has painted several murals and a school, hosted film screenings, organised cleaning campaigns, donated clothes to over 700 people, and fed more than 2,000 meals to refugee children. Video shot and edited by Alia Gilbert. Music credit: Water by Amer Ammouri. Eamonn Sheehy is an Irish writer focusing on human rights, minorities and the stories of the marginalised. He freelances for online and print publications covering international affairs, fringe travel, and social issues. Migrate to the Fringe is a project which endeavours to explore the stories of people struggling on the margins of society. This entry was posted on 13/01/2014 by mondepasrondeditor in activism, interview, journalism and tagged Eamonn Sheehy, Lebanon, Palestine, refugees, Shatila.